She'll love every step she takes in the Keds® Kids Champion Heart sneakers. Printed fabric upper features Kate Spade® New York logo at back and heart detailing at back. 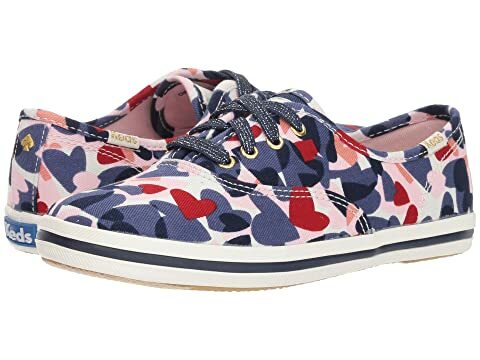 We can't currently find any similar items for the Champion Heart (Little Kid/Big Kid) by Keds x kate spade new york Kids. Sorry! Fit perfect and makes for a great spring/summer sneaker. Love, love, love these shoes. A perfect fit. Colors are true to what you see on your computer screen. These shoes may be one of the cutest, most comfortable shoes I have ever owned. I'm considering purchasing a second pair in my same size to wear when my first pair is no longer wearable since I think they may be my "forever" sneakers. BTW, I received two pairs of shoe laces--one was blue with lots of sparkles; the other was simply matching blue. I guess you could wear the sparkly pair if you get up feeling peppy and sparkly (or maybe feeling gloomy-and-doomy and need a bit of a pick up!). The simply blue laces are perfect for a "hey, folks, I'm running on cruise control today" kind of day.